1. The Grand Place, July 2008. Once upon a time, the French city of Lille was just a hop, skip and a jump away from my apartment in Brussels. So one weekend I boarded a train and eighty minutes later I was in Lille! My only other French adventure had been a trip to Paris, and while the city of romance hadn’t disappointed, there was something much more laid back and sincere about Lille. Indeed from my first stroll I sensed a distinct lack of pretension. The locals seemed genuinely friendly actually appeared happy. They were also able/willing to speak English. Was I really in France? Lille’s eye-catching epicentre is this massive square, with enough stunning architecture and atmospheric bars and cafes to rival Paris. 2. La Vielle Bourse, July 2008. The Grand Place’s most impressive façade is this seventeenth century former stock exchange, which will have you getting your camera out before you’ve even finished taking it all in. Comprised of twenty-four identical houses, visitors can climb its ornate bell tower to check out the statue of Mercury (god of commerce), while a wander through the inner courtyard offers up tango performances, keenly contested chess matches and a couple of souvenir shops. 3. Second Hand Book Market, July 2008. Time your visit for a Sunday afternoon and you can leaf your way through this cool second hand book market. While the titles on offer are largely French language, dig around a bit and you could unearth some gems in an array of unexpected languages! An English copy of The Count of Monte Cristo, a Swedish translation of Great Expectations, you never quite know what’ll be up for grabs. There are also a few stalls of intriguing old photographs. 4. Gare De Lille Flandres, July 2008. Lille’s main train station, dating back to 1842, is located just five hundred meters from the city’s other rail hub, Lille Europe. This is the most charismatic of the two buildings though, with its expansive concourse and touches of artwork and sculptures throughout. Give the six Euro cardboard sandwiches the wide berth they deserve! 5. Rue De Lille, July 2008. 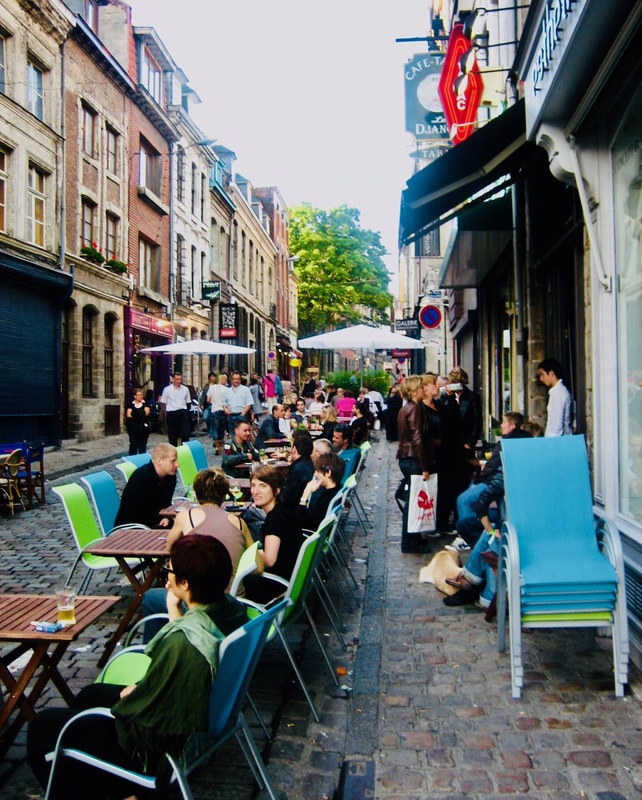 If you only have one night in town, look no further than Rue De Lille for some top-notch Lille-style chow. With some seriously fine dining on offer dinner can get expensive, especially if you go for the oysters, lobsters, foie gras, caviar and smoked salmon approach. Fear not though, there are lots of traditional French bistros that won’t split your wallet in two, as well as Moroccan restaurants, steakhouses and more! For more on my French adventures, take a look at my article on Paris. For more on this region of Europe, check out My 5s on Belgium, The Netherlands and Luxembourg. What a quaint town! Doubt I’ll ever get there so I’m glad for the short visit via Leighton Literature.